THE BEAUTY (and frustration) of fly fishing in Michigan is that the trout usually dictate the rules of engagement. With stump-laden rivers, fickle weather, and completely unpredictable insect hatches (sometimes it’s magical, sometimes the angler is left wondering), the fly guy has no choice but to improvise on options and approaches. But in the dead of night—especially in the sweaty, sultry, dark hours of summer—something completely insane and unexpected often happens. Those rivers you think are lacking big trout are apt to boil in the darkness. And the mouse fly is the key to making that happen. The other night, for example, I floated with Tim Romano and guide Matt Dunn on a certain (sacred) Michigan river. We put in at 6 p.m. and soon found a sporadic bite on caddis flies. Later (at twilight), the gray drakes fell, en masse, and we hooked many browns slurping on the surface. But the real action happened in the pitch-blackness of a new moon, as Matt steered the boat by memory, and Tim slapped blind casts with a mouse fly against the banks. Tim gently swung his fly over the runs… and big browns (the kind you don’t see during the day) hammered the surface with toilet-flush slurps and slashes. It freaked me out. 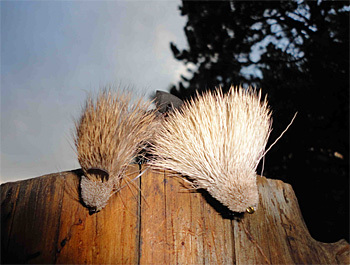 The mouse is one of the least-understood yet most deadly effective fly patterns in America. And the mouse-fly phenomenon isn’t just limited to virgin Alaskan rivers. It’s happening all around all of us. Every night. If you think trout are timid fish, go swim a mouse pattern across a river at night. The big boys, well, they love protein. And nothing says “Quarter-Pounder with Cheese” to a trout better than a mouse fly shimmering and struggling across the water surface. Some disclaimers: Fishing after dark is discouraged (if not illegal) in many places. Fishing deep water and runs after dark can be dangerous (so know your water). And when you’re casting blindly, you’re apt to lose many flies and frustrate yourself (though, for the record, Romano made a full two-hour pitch-black float, rolling and hooking several fish, without losing his fly — one of the most impressive fly-casting spectacles I’ve ever seen on a river, day or night). The point: Big trout eat big flies… and they do so at night. Whether this theory transposes beyond Michigan to Pennsylvania, Colorado, Montana, and beyond — I can only assume and hope that’s true. I have fished Colorado rivers (successfully) with mouse flies before, but I’m making bigger plans now. As for technique: From the bank, shoot a cast, and swing that fly through the run. From a boat, hit the banks, and swim it on the swing back toward you. It isn’t rocket science. It might not even be “Jazz.” (The only analogy I can make is with the great movie and soundtrack involving one of my favorite tenor sax players, Dexter Gordon). But I hope you go “mousing” as soon as you can… in a place you think might be ripe. I’m sure you won’t be disappointed (even if you “roll” more than you catch). And I know, by doing so, you’ll join the ranks of “jazzy” fly fishers. No doubt you’ll find a new respect for what’s really out there, swimming beneath the surface of your favorite river. I promise.